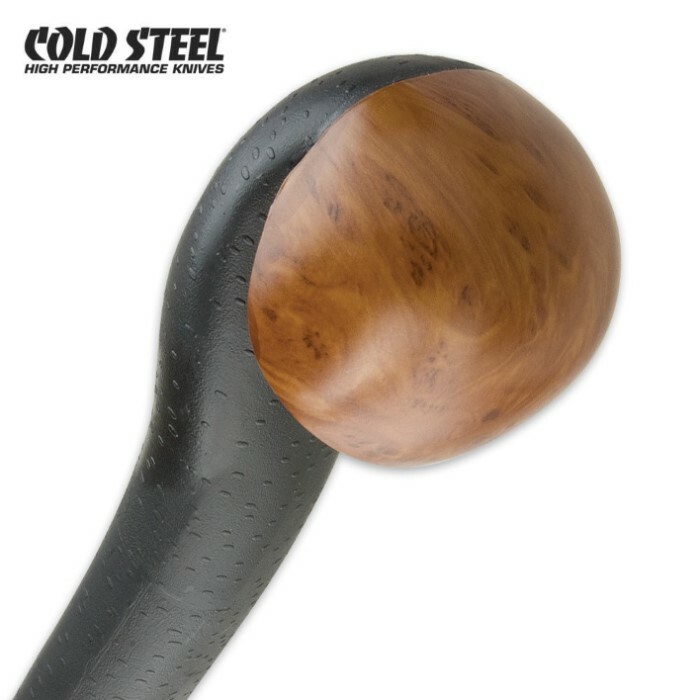 An authentic Blackthorn from Cold Steel"s Presidents private collection inspired Cold Steel"s Irish Blackthorn Walking Stick. This superb faux Blackthorn walking stick is injection molded from polypropylene so it will never warp, crack, swell up, or splinter. It is also easy to maintain with a little soap and water. 2 3/4" head, 37" overall. The time has come in my life where a walking aid is needed from time to time. I trained in the arts of self defense in my younger days. Though my legs have lost their defensive skills, my hands haven't-plus Black Thorn in hand. The Warrior Spirit is stronger. While shopping, and in other crowds I notice people checking out the Black Thorn. Keeping a straight face as if not to notice, I think to myself. "Yes, it's a weapon. And if needed I WILL use it." Comfortable fit in the palm. Right length for me, I'm 6'0". A slight weight which I like, it tells me it will withstand impact. It will last the length of my life time, and beyond. I just came from Ireland and had many locals tell me What a beautiful 'Black Thorn' you have there. And they do not break, at least from my experience. Item was exactly what i thought it would be, very sturdy design, as said could easily be used as a walking aid or a self defense weapon. The first thing i noticed when i got this in was it didn't exactly look like the picture shown. Its not as shiny, the stick part isn't a thin as shown and the brown hand grip at the top doesn't look as high quality. But all things aside it still looks good and is very sturdy. Good product but the photo needs to look like what you get. Awesome walking stick very sturdy and solid feel. I will not have to worry about those mean dogs in the neighborhood or anyone else for that matter. I have a secure feeling while using my blackthorn walking stick i can now enjoy walking at nite like i did as a kid.Thanks true swords for a great value and fast shipping. I bought this cane some months ago, then wondered what I was thinking ... although it did look cool in the umbrella stand. Then.... 7 weeks ago I slipped & fell hard and cracked several ribs and collapsed a lung. I missed almost 6 weeks of work. The blackthorn cane became my constant companion. Not only did it give me mobility, but it could probably be used effectively to ward off a pack of wolves. It was a lifesaver during my recovery. Buy one now, just in case you need it later! I recieved my Blackthorn, and all I can say is "Wow". I pulled it out of the box, and first thing I noticed was the end and all I thought was "hmm, this really IS plastic", but when I unwrapped it...I got to admire it. The paintjob in the head is supurb, and the stick itself isn't slick but slightly textured which increases your hold on it. Another thing easily noticed is that it is a little larger than I anticipated. The only downside is the "wooden" knob at the end is a seperate piece attached. Its attached solidly, but there are some small gaps between the two pieces. But despite that, the positives greatly outweight the downside! 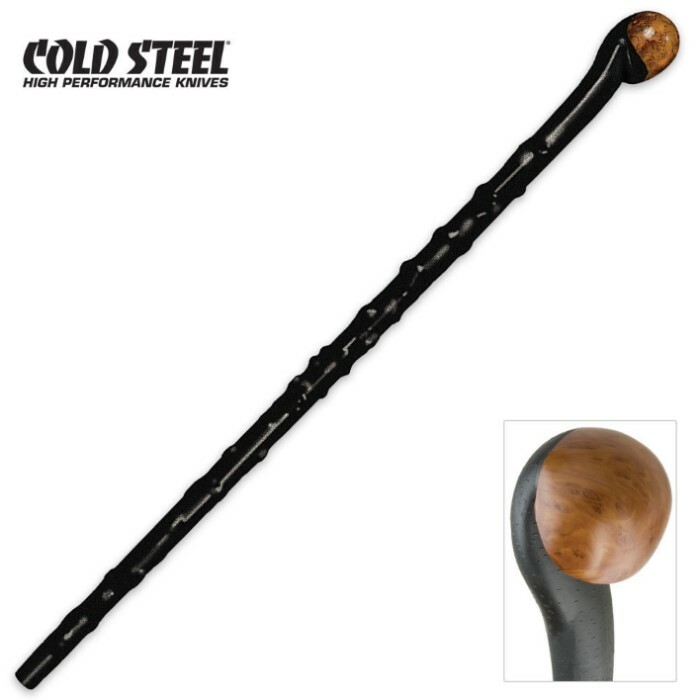 This is a definate buy for anyone who wants a good walking stick, club, or both! when it first came in the mail i didn't really like it it felt flimsy and like it would break with a couple wacks. now that i have had it for a while i love the thing. it has a nice weight to it it really heavy for plastic. my only problem is that the wood colored paint on the head chips off with any real bump. overall i love this cane. I purchased this Walking Stick from True Swords. I received it very fast and the stick itself is absolutely great. I use it every day and hike with it often. A definate purchase well worth your money.